Each week in our children's ministry service, we take a minute before the offering time to teach the kids a lesson about giving. We are seeking to give them a foundation of generosity, so they can experience a lifetime of the blessings and joy of being a giver. 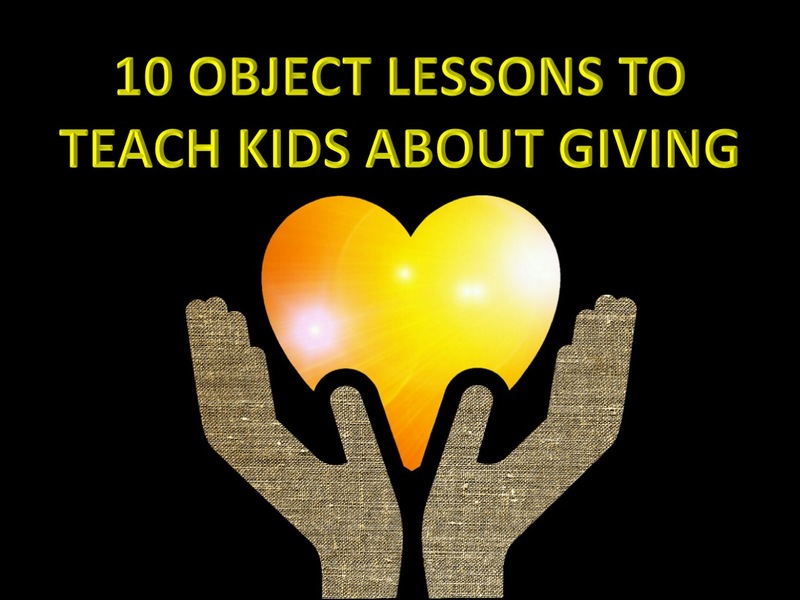 Here are 10 object lessons we've used in recent months to teach kids about giving. Feel free to use these in your ministry. Read Acts 20:35 with the kids - "It is more blessed to give than to receive." Show the kids the words Giving and Receiving. Ask the kids which the Bible says is greater...giving or receiving? Explain to the kids that it's okay to receive things. It's nice to get awards, birthday gifts, etc. Show the kids this - GIVING > RECEIVING. But it's even better to give to help others because it makes an eternal difference and you're like Jesus when you give. He came to give instead of receive. Read Proverbs 28:27 with the kids - "Whoever gives to the poor will lack nothing, but those who close their eyes to poverty will be cursed." Bring up a picture of kids in need. Explain that there are people locally and around the world who are in need. They are in need physically and spiritually. When we see this, we have two choices. We can respond by giving or close our eyes to their needs. Have the kids close their eyes to the picture of the kids in need for a few seconds and then open them back up. Encourage kids to not close their eyes to those in need, but to look and respond by giving their offering to help others both physically and spiritually. When you do this, God has promised to provide for your needs. Read Luke 6:38 with the kids - "Give, and you will receive. Your gift will return to you in full - pressed down, shaken together to make room for more, running over, and poured into your lap." Hold up an empty clear cup. Have another clear cup that is half full with water. Pour some water from the half full cup into the empty cup. Bring out a clear pitcher of water. Use the pitcher to overflow the cup you poured water from. Explain as you are doing this that when we give, God has promised to fill us back up to overflowing. You can't out give God. Show a picture of General Sherman - the tallest tree in the world. It is located in Sequoia National Park. It is 102 feet around and 275 feel tall. When you give your offering, it's like planting a seed. It will grow into big things and make a big impact in people's lives. Hold up a dollar bill. Ask kids if they have ever noticed that it says "In God We Trust." This is a great reminder that when we give our offering, we can trust God to take care of us and provide for our needs. Have the kids read Matthew 6:33a with you - "Seek the kingdom of God first." Hold up two apples - one whole and one half-eaten. Explain that we should put God first with our money (hold up the whole apple). When we don't give Him 10% or we give Him whatever is left over after we finish spending on things we want, it's like we are giving him the leftovers (hold up the half-eaten apple). Put God first in your giving. Show a picture of a $1 bill and a $1000 bill. The Bible says if you are faithful with a little, then God will trust you with more. May not have a lot of money to give as a child. Maybe you get a little money from your allowance, birthday gifts, chores, etc. Whatever it is, it's not likely a thousand dollars. God says to be faithful to give from what you have now. And as you are faithful with a $1, then God may give you the opportunity to be faithful with thousands of dollars one day. Read 2 Corinthians 9:7 with the kids - "Each one of you should give what he has decided in his heart to give, not out of regret or compulsion. For God loves a cheerful giver." Show a picture of the frowning face. We can give money to God with a bad attitude. Perhaps because your parents make you or you feel guilty. Show a picture of the smiling face. Or we can give with a good attitude that says, "I'm giving this back to God because He is awesome and I love Him. He deserves my best!" Explain that we have the opportunity each week to show God how much we love Him by giving our offering. Tell the kids you have some money in your pocket. Ask them to guess how much it is. Pull out the coins and reveal how much you have. See who was closest. Explain that God knows everything. He knows how much money we have. One of the ways we can worship Him for being so awesome, powerful and all-knowing, is by giving back some of our money to Him. Teaching the children in this direction requires a special patience and appropriate methods. However, the result is worth the effort.